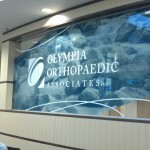 Decorative Window Film is dominating the Window Film industry in the Seattle Tacoma area and Digital UV Printing is pushing it right along. 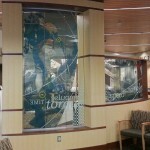 Within the last 3 months or so we have received a copious amount of requests for custom decorative film. 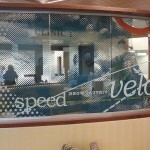 Whats cool about this digital UV Print is that it truly is custom.�Generally an Architect or Graphic Designer will design and provide us with a graphic file or logo, that a business may already have on their business cards, then we print it on a clear film with a special UV ink that allows it to be more durable than most printed graphics (layman’s�terms – it�doesn’t�fade or discolor). These type of Digital Designs and graphics can have a full range of detail and color and be depicted clearly when finished. Another awesome aspect of Digital Print is it works just like a printer so you can print multiple colors on one sheet of film, unlike 3M cut vinyl graphics (which is a lot more labor intensive) where there is over lapping for different colors. the pictures above are a prime example of this. Its like a All-In-One Printer for graphics and window film.